Below are provided references and links to the papers on Tardigrada published in the last three months. The icon 'NEW' appears until one month after a paper was added to the list. After three months references are moved to the 'Archives'. Morek, W., Suzuki, A., Schill, R.O., Georgiev, D., Yankova, M., Marley, N. & Michalczyk, Ł. (2019) Redescription of Milnesium alpigenum Ehrenberg, 1853 (Tardigrada: Apochela) and a description of Milnesium inceptum sp. nov., a tardigrade laboratory model. Zootaxa, 4586(1): 35-64. Sugiura, K., Minato, H., Suzuki, A.C., Arakawa, K., Kunieda, T. & Matsumoto, M. (2019) Comparison of Sexual Reproductive Behaviors in Two Species of Macrobiotidae (Tardigrada: Eutardigrada). Zoological Science, 36(2): 120-127. Fujimoto, S. & Hansen, J.G. (2019) Revision of Angursa (Arthrotardigrada: Styraconyxidae) with the description of a new species from Japan. European Journal of Taxonomy 510: 1-19. Fontaneto, D. (2019) Long-distance passive dispersal in microscopic aquatic animals. Movement Ecology, 7:10. Gąsiorek, P., Vončina, K. & Michalczyk, Ł. (2019) Echiniscus testudo (Doyère, 1840) in New Zealand: anthropogenic dispersal or evidence for the "Everything is Everywhere" hypothesis? New Zealand Journal of Zoology, 46(2): 174-181. Gąsiorek, P., Morek, W., Stec, D., Blagden, B. & Michalczyk, Ł. (2019) Revisiting Calohypsibiidae and Microhypsibiidae: Fractonotus Pilato, 1998 and its phylogenetic position within Isohypsibiidae (Eutardigrada: Parachela). Zoosystema, 41(6): 71-89. Gross, V., Treffkorn, S., Reichelt, J., Epple, L., Lüter, C. & Mayer, G. (2019) Miniaturization of tardigrades (water bears): Morphological and genomic perspectives. Arthropod Structure & Development, 48: 12-19. Slivko-Koltchik, G.A., Kuznetsov, V.P. & Panchin Y.V. (2019) Are there gap junctions without connexins or pannexins? BMC Evolutionary Biology, 19(S1): 46. Greven, H. (2019) From Johann August Ephraim Goeze to Ernst Marcus: A Ramble Through the History of Early Tardigrade Research (1773 Until 1929). In: Schill, R.O. (Ed.) Water Bears: The Biology of Tardigrades, 1-55. Møbjerg, N., Jørgensen, A., Kristensen, R.M. & Neves, R.C. (2018) Morphology and Functional Anatomy. In: Schill, R.O. (Ed.) Water Bears: The Biology of Tardigrades, 57-94. Jørgensen, Kristensen, R.M. & Møbjerg, N. (2018) Phylogeny and Integrative Taxonomy of Tardigrada. In: Schill, R.O. (Ed.) Water Bears: The Biology of Tardigrades, 95-114. McInnes, S.J. & Pugh, P.J.A. (2018) Tardigrade Biogeography. In: Schill, R.O. (Ed.) Water Bears: The Biology of Tardigrades, 115-129. Guidetti, R. et al. (2018) Paleontology and Molecular Dating. In: Schill, R.O. (Ed.) Water Bears: The Biology of Tardigrades, 131-143. Bertolani, R. & Rebecchi, L. (2018) Cytology and Cytogenetics. In: Schill, R.O. (Ed.) Water Bears: The Biology of Tardigrades, 145-161. Nelson, D.R., Bartels, P.J. & Guil, N. (2018) Tardigrade Ecology. In: Schill, R.O. (Ed.) Water Bears: The Biology of Tardigrades, 163-210. Altiero, T., Suzuki, A.C. & Rebecchi, L. (2018) Reproduction, Development and Life Cycles. In: Schill, R.O. (Ed.) Water Bears: The Biology of Tardigrades, 211-247. Guidetti, R. & Møbjerg, N. (2018) Environmental Adaptations: Encystment and Cyclomorphosis. In: Schill, R.O. (Ed.) Water Bears: The Biology of Tardigrades, 249-271. Schill, R.O. & Hengherr, S. (2018) Environmental Adaptations: Desiccation Tolerance. In: Schill, R.O. (Ed.) Water Bears: The Biology of Tardigrades, 273-293. Hengherr, S. & Schill, R.O. (2018) Environmental Adaptations: Cryobiosis. In: Schill, R.O. (Ed.) Water Bears: The Biology of Tardigrades, 295-310. Jönsson, K.I., Levine, E.B., Wojcik, A., Haghdoost, S. & Harms-Ringdahl, M. (2018) Environmental Adaptations: Radiation Tolerance. In: Schill, R.O. (Ed.) Water Bears: The Biology of Tardigrades, 311-310. Boothby, T.C. (2018) Molecular Biology in Tardigrades. In: Schill, R.O. (Ed.) Water Bears: The Biology of Tardigrades, 331-347. Degma, P. (2018) Field and Laboratory Methods. In: Schill, R.O. (Ed.) Water Bears: The Biology of Tardigrades, 349-369. Degma, P. & Guidetti, R. (2018) Tardigrade Taxa. In: Schill, R.O. (Ed.) Water Bears: The Biology of Tardigrades, 371-409. Vasanthan, T., Nederveen, J.P. & Stone, J. (2019) Quantum-like decreased embryogenesis time with increased cold exposure time. Scientific Reports, 9: 1229. Morek, W., Stec, D., Gąsiorek, P., Surmacz, B. & Michalczyk, Ł. (2019) Milnesium tardigradum Doyère, 1840: the first integrative study of inter-population variability in a tardigrade species. Journal of Zoological Systematics and Evolutionary Research, 57(1): 1-23. Moldovan, O.T. (2018) An Overview on the Aquatic Cave Fauna. In: Moldovan O.T. et al. (eds) Cave Ecology. Ecological Studies (Analysis and Synthesis), 235. Springer, Cham. Roszkowska, M., Gawlak, M., Draga, M. & Kaczmarek, Ł. (2019) Two new species of Tardigrada from Ecuador (South America). Zootaxa, 4545(4): 511-530. Guil, N., Jørgensen, A. & Kristensen, R.M. (2019) An upgraded comprehensive multilocus phylogeny of the Tardigrada tree of life. Zoologica Scripta, 48(1): 120-137. Guidetti, R., Cesari, M., Bertolani, R., Altiero T. & Rebecchi, L. (2019) High diversity in species, reproductive modes and distribution within the Paramacrobiotus richtersi complex (Eutardigrada, Macrobiotidae). Zoological Letters, 5:1. Miller, W.R. & Perry, E.S. (2018) Adjustments to the Annotated zoogeography of non-marine Tardigrada. Part III: North America and Greenland by Kaczmarek, Michalczyk & McInnes (Zootaxa 4203). Zootaxa, 4543(1): 99-114. Kuzmic, M., Richaud, M., Cuq, P., Frelon, S. & Galas, S. (2018) Carbonylation accumulation of the Hypsibius exemplaris anhydrobiote reveals age-associated marks. PLoS ONE 13(12): e0208617. Molavi, F., Mokhtari, A., Nayebi Moghaddam, S., Abedian, S.M.J. & Azimi Taraghdari, Z. 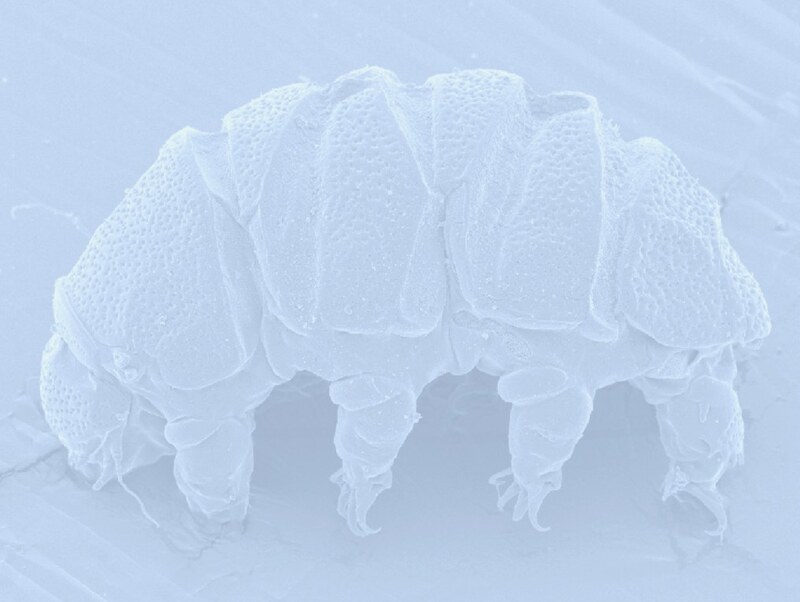 (2018) First record of the tardigrade Echiniscus testudo (Doyère, 1840) from northeast of Iran (Heterotardigrada: Echiniscidae). Iranian Journal of Animal Biosystematics, 14(1): 7-14.